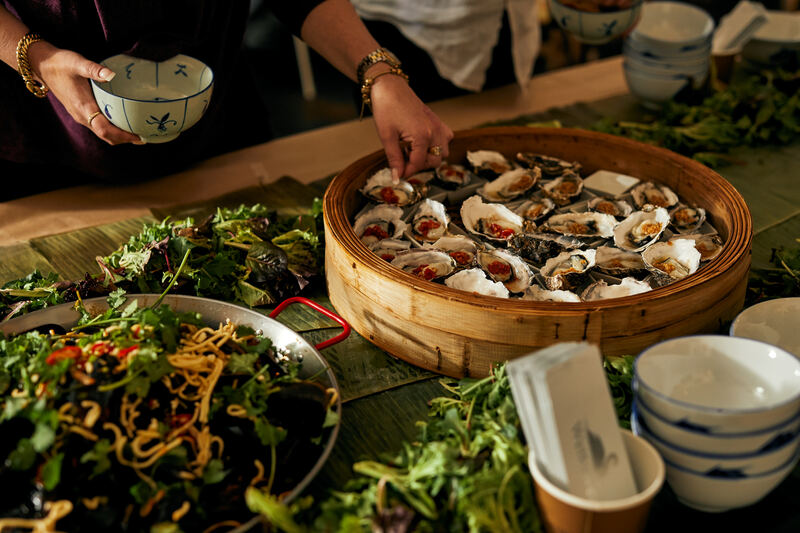 Changing the way we dine, David’s returns with another bottomless communal seafood feast after last year’s sold- out MFWF event, set for Thursday 14 March. As a nod to the river village of Old Zhouzhuang, diners will stand around a long banana leaf-lined table filled with wok- fired king prawns, pipis, muscles and oysters, flavoured to perfection with David’s in-house XO sauce. As the chef pours seafood straight from the wok, soak up the juices with steamed mantao buns to make the most of the garlic and chilli juices. Seafood enthusiasts will need to roll-up their sleeves, the crowning jewel of the night will be the XO chilli crab, served at David’s for the first time. Shoulder-to-shoulder, diners will be transported to the 1600- year-old village as projections of the famous Zhouzhuang river are reflected on the walls in an immersive experience that includes live music. Harbouring enough seafood to feed a small village, the feast will encourage guests to get their hands dirty as well as using the utensils provided for maximum flavour pay-off. To wash down the rich flavours of the night, David’s will also be pairing the banquet with bottomless Victorian wines. For one night only, Chapel Street’s Oriental Teahouse will transform their entire restaurant into a street-food block party on Thursday 21 March. The stand-up event will consist of themed food stations around the venue, with drinks flowing and a DJ playing. One Night in Shanghai pays homage to the buzzing night- life to be found at the Shanghai night markets, in which a lively lion dance will come out to traverse the stalls midway through the evening. Near the entrance, a sizzling panfry station will bring performance to the humble dumpling, churning out pork and chive dumplings, as well as veggie panfry dumplings to hungry arrivals. Downstairs will offer an open-plan dining experience where patrons can load up their bamboo boats with street food classics such as san choi bao, chicken ribs, salt and pepper calamari and more at one station, then move along to a dumpling destination tucked down the back for those craving hot BBQ pork buns and hand-made shu mai. Amid the hanging red lanterns, seating will be provided for those who want to stop and take in the atmosphere. Extra seating will be available upstairs at Zhou Zhou where the bar will also be pouring a selection of local beers, wines and iced teas to match the bar offering downstairs. Servers will be roving around topping up glasses and offering delicious canapes, ensuring no such shortage of food and drinks. The unlimited street feast invites party- goers to taste their way through the teahouse in what will be a sensory overload of flavours, smells and live performance – a street party not to be missed.